Marco polo about Armenia: from Description of the Greater Hermenia. This is a great country. It begins at a city called ARZINGA, at which they weave the best buckrams in the world. It possesses also the best baths from natural springs that are anywhere to be found. The people of the country are Armenians. There are many towns and villages in the country, but the noblest of their cities is Arzinga, which is the See of an Archbishop, and then Arziron and Arzizi. The country is indeed a passing great one… At a castle called Paipurth, that you pass in going from Trebizond to Tauris, there is a very good silver mine. And you must know that it is in this country of Armenia that the Ark of Noah exists on the top of a certain great mountain [on the summit of which snow is so constant that no one can ascend; for the snow never melts, and is constantly added to by new falls. Below, however, the snow does melt, and runs down, producing such rich and abundant herbage that in summer cattle are sent to pasture from a long way round about, and it never fails them. The melting snow also causes a great amount of mud on the mountain]. – Buckram is fine cloth with a lustrous surface, highly prised in midle ages. – Arzizi, ARJISH, in the vilayet of Van, was destroyed in the middle of the 19th century. Arjish Kalá was one of the ancient capitals of the Kingdom of Armenia. Arjish is the ancient Arsissa. – Paipurth, or Baiburt, on the high road between Trebizond and Erzrum, was an Armenian fortress in the first century. 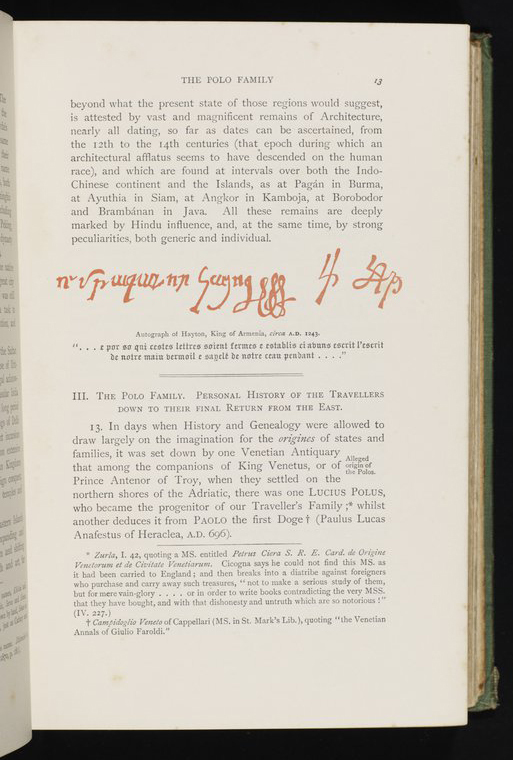 This is the authograph of Hayton (Hethum I) from Marco Polo’s book, “Travels of Marco Polo”. Bellow scan of the book page, and a black and white reproduction. Do you, by any chance, have the book of Gandzaketsi about the Hetum I’s trip to Mongolia? To read about our past from all these foreign sources instills in the Armenian psyche particularly in the youth that, yes indeed, we have had a great past, and that once, only once upon a time we were… but not anymore. All is nice and wonderful. [not Hayton] travel to Astrakhan. The subject king’s name is ՀԵԹՈՒՄ never referred to by its real name. To conclude, I suggest that while presenting your famous foreign sources always give the Armenian equivalence.